This document provides an architectural overview of the Apache CXF services framework. Front-end: Front-ends provide a programming model to create services. Messaging & Interceptors: These provide the low level message and pipeline layer upon which most functionality is built. Service Model: Services host a Service model which is a WSDL-like model that describes the service. Protocol Bindings: Bindings provide the functionality to interpret the protocol. In the upcoming sections, we'll take a look at each layer in turn and examine how they work together. The bus, being CXF's backbone, is a provider of shared resources to the CXF runtime. Examples for such shared resources include WSDL managers and binding factory managers. The bus can easily be extended to include your own custom resources or services, or you can replace default resources like the HTTP destination factory (based on Jetty) with your own (possibly based on another web container such as Apache Tomcat). This extensibility is made possible by dependency injection; the default bus implementation is based on Spring Framework, which wires the runtime components together for you. See Configuration of the Bus for an example of how to customize the bus by supplying your own bean configuration file and Configuration of Runtime Constructed Objects for more information on the special case of injecting into objects created by the runtime (as opposed to objects created by the IoC container itself). CXF is built on a generic messaging layer comprised of Messages, Interceptors, and InterceptorChains. Interceptors are the fundamental unit of functionality. By dividing up how messages are processed and sent, this gives CXF a very flexible architecture. It can be reconfigured at any point in the processing. This also gives CXF the ability to pause & resume interceptor chains. A WS-Security interceptor which decrypts or authenticates an incoming message. Interceptors are uni-directional and are inherently unaware of whether they are dealing with a request, response, or fault. CXF provides an InterceptorChain implementation called the PhaseInterceptorChain. When Interceptors are added to the chain, they are grouped into ordered phases. A PhaseInterceptor may provide guidance as to how it is to be ordered within the phase. Let us take a hypothetical simplified example (NOTE: these phases and interceptors don't necessarily exist in CXF). Let us say we are parsing a SOAP message. We may want to have two phases. First, a dispatch phase which parses the soap headers and determines which service to route the Message to. Second, an unmarshal phase which binds the SOAP body to JAXB objects. In the first dispatch phase we could implement this via two interceptors, first a ReadHeadersInterceptor which parses the headers and second a WS-AddressingInInterceptor which determines which service we're invoking from the WS-Addressing header. In the second unmarshal phase, we have just a single JAXBUnmarshallerIntercptor. Both the ReadHeadersInterceptor and AddressingInInterceptor would tell the PhaseInterceptorChain they are in the "dispatch" phase by returning "dispatch" when getPhase() is called. Additionally, the ReadHeadersInterceptor could specify that it wants to run before the AddressingInInterceptor by returning the interceptor id when Interceptor.getBefore() is called. Before it was mentioned how chains were very dynamic and flexible. In our above example, we could add interceptors specific to that service once it is resolved. Or we could pause the chain once while we wait for some external chain, like an asynchronous service response. At any point during processing, an interceptor may throw a Fault, or a derivative of a Fault like the SoapFault. This will cause the chain to stop invoking and unwind it. Unwinding consists of calling handleFault on each interceptor that was invoked in reverse order. InterceptorChains have the concept of a fault observer. Once the chain is unwound, the fault interceptor is invoked with the message that caused the fault. The fault observer may trigger a new chain which then invokes a specified set of interceptors meant to handle faults. In addition to the concept of a Message, there is the concept of the Exchange. The exchange class holds a references to the in, out and fault messages for the current message exchange. It also holds properties specific to the exchange, and not just the message. For instance the Exchange holds the Service that is current being invoked in it. The Service model is the representation of a service within CXF. It is made up of two parts. First there is the ServiceInfo which contains a WSDL-like model of the service and its operations, bindings, endpoints and schema. Second, there is the Service itself, which contains the ServiceInfo, data-binding information, service interceptors, service properties and more. A service can be constructed from many different sources including classes and WSDLs (1.1 or 2.0). Typically front-ends are responsible for creating a service via service factories. Factory components such as ServerFactoryBean and ClientProxyFactoryBean can used with the front-end to create, publish and consume web services. The factory classes build up the service model and configure the service interceptors, data bindings and more. Data bindings implement the mapping between XML elements and Java objects. Data bindings convert data to and from XML, produce XML schema, and provide support for wsdl2java code generation. Not all data bindings support all of this functionality. At very least, a data binding must provide the data conversion. 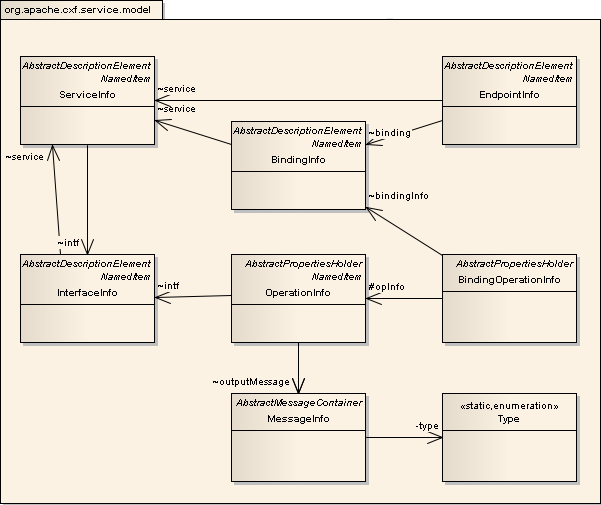 See Data Binding Architecture for details. Currently supported data bindings include JAXB 2.x (default) and Aegis. Bindings provide ways to map concrete formats and protocols on top of transports. A binding contains two main parts, a BindingFactory and a Binding. A BindingFactory builds a Binding from the service model's BindingInfo. The binding contains interceptors specific to the binding and also implements the createMessage() method, which creates a Message implementation specific for that binding. CXF currently supported the following bindings protocols: SOAP 1.1, SOAP 1.2, REST/HTTP, pure XML and CORBA. The prototypical binding is SOAP. It has its own Message class called the SoapMessage. It adds the ability to hold the current SoapVersion and the headers for the message. These inform the SOAP interceptors as to what headers and roles the particular SOAP interceptor understands. MustUnderstandInterceptor: Checks the MustUnderstand attributes of all the headers against all the SoapInterceptor's getUnderstoodHeaders method. Other bindings include REST/HTTP binding, pure XML binding, and the CORBA binding. CXF includes its own transport abstraction layer to hide transport specific details from the binding and front end layers. Currently supported transports include: HTTP, HTTPs, HTTP-Jetty, HTTP-OSGI, Servlet, local, JMS, In-VM and many others via the Camel transport for CXF such as SMTP/POP3, TCP and Jabber. Learn more about transports here. Call conduit.prepare(message): this starts the message sending. At this point a Conduit may initiate a connection and set the OutputStream for the outgoing message. Call to conduit.close(message): this closes and disposes of any existing resources for the message sending. A message sender may also register a MessageObserver with the Conduit. If the Conduit is synchronous, the MessageObserver will be notified once a response has been received. The most common MessageObserver used in CXF is the ChainInitiationObserver. This takes the incoming message, creates a message Exchange & PhaseInterceptorChain, then starts the chain. Here's a small example of what might happen when we publish a service via the JAX-WS Endpoint.publish() method. The JaxWsEndpointImpl creates a Binding and Destination to listen on. CXF's Software Quality approach is detailed here.